Still foggy, although it's a little thinner today. Grrr. This morning, we went on a tour of old Beijing. This is the hutong ("narrow street") section, and we travelled by rickshaw, which is a bicycle that has a covered seat for two grafted onto the back. I'm sure Kat will have something to write about this tour, as she was quite fascinated. 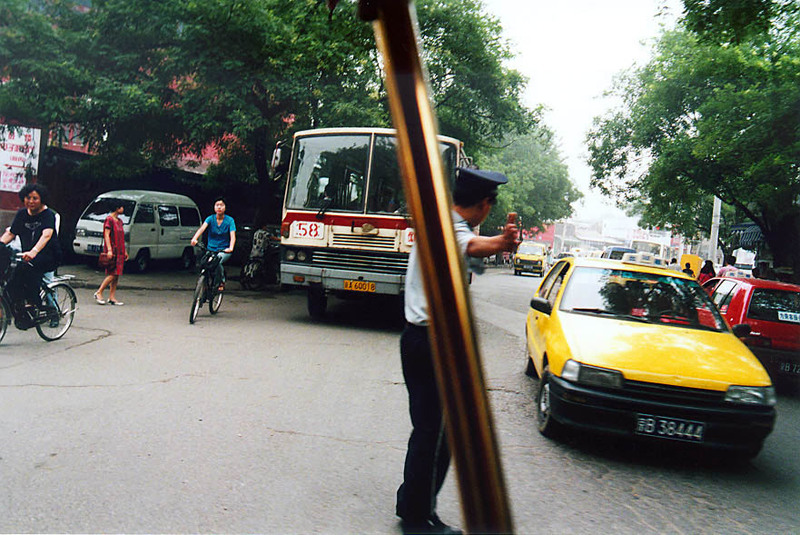 Anyway, we were driven via rickshaw through the streets of old Beijing, dodging and weaving around taxis, trucks, buses, and policemen. And the other rickshaws. Even the main streets in this area are narrow, but they're nothing compared to the real hutong. 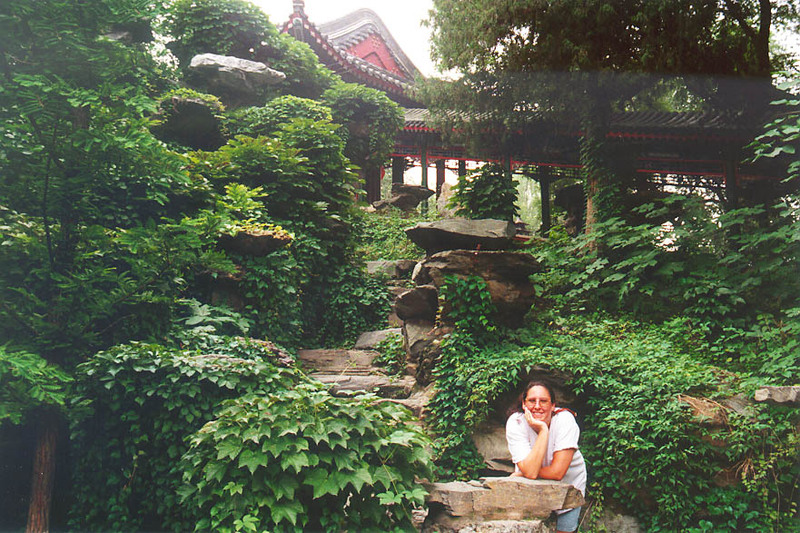 The main points were a visit to the Drum Tower, an ancient center of Beijing and home to a truly scary flight of stairs; a residential dwelling, where we met a retired archaeologist and his wife (and parakeet and cat); the gardens of a 16th-century nobleman; and the hutong area itself, with truly fascinating streets-- narrow, crooked, and cluttered. Each house touched the next, side by side, and practically closed up the streets, it seemed. The Drum Tower, which is a few stories tall, used to be at the center of Beijing, and was used to announce the opening and closing of the city at the beginning and end of each day. The drums inside are the largest in the world, each one lying on one side and measuring probably six or seven meters in diameter. They aren't played very much any more, since the drumheads are fragile; the last time was for a session of the Youth Olympics, I think they said. Maybe it was something else. Lunch-- like yesterday's. Nothing outstanding. As for the afternoon, we saw the Temple of Heaven. This is where the Emperor would pray, twice a year, for good luck and good harvest. Again, the Forbidden City motif was in force: vast empty stretches ended with imposing, impressively decorated structures. There were a lot of circle and square shapes. For example, there was a prayer spot which was a raised, rouded patio surrounded by a low wall, and beyond that wall, a square wall. The square represents the earth, while the circles represent heaven. Then, after walking down a long, open walkway, you come to another area like the last, except this one has shrines to various gods. We made a small offering to the God of Heaven, and a larger one to the Gods of Weather, to whom I made a plea for beautiful weather during the cruise in specific, and the rest of the tour in general. 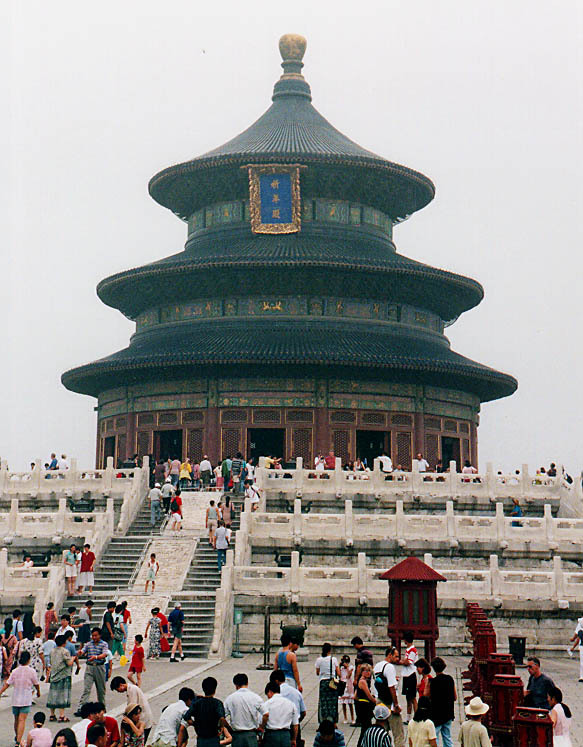 After that, we finally came to the actual Temple of Heaven, which is a huge, circular structure. The roof is held up using columns and a cantilever system of beams; very impressive, and once more, it's still working centuries later. The painting of the temple structure was outstanding, as were the carvings and statues within. Then it was off to the airport, where we had two hours to wait for our flight's departure time. As it turned out, we needed most of it to get our tickets and clear customs. The flight was uneventful. We found that the weather conditions were widespread as we broke into clear air and saw nothing but clouds beneath us. This continued almost all the way to Shanghai. One thing of interest was that we flew parallel, and quite close, to the contrail left by another jet, for about half an hour or so. It was fascinating to be able to examine the structure of the contrail like that. At the airport, we met our local guide, Wei Ming, a cheerful older woman of a fairly relaxed disposition. This would be tested over the next few days, but at this point, we simply rode the bus to our hotel, marvelling at the sights of Shanghai. As we moved through the city, one skyscraper after another rose before us, in shapes and colors which would seem odd in America. I speculated that this was the sort of thing which led to the visions you see in movies like "Akira," although I realize that's probably not a direct link. Turn it around, though: the sort of skyline you see in "Akira" is what we were seeing in Shanghai. I'm sorry to report that here we are staying in a Sofitel. I had a really, really negative experience with Novotel when travelling in France, and vowed to avoid them and their sister companies. Unfortunately, we don't have a whole lot of choice here, so I'll simply have to bear it as best I can. Upon reaching the hotel, we completely repacked our luggage. Kat's bag had been frustrating her, so we switched. This accomplished, we collapsed into a deep and needed sleep.